The Sixers are winners of five in a row, firmly entrenched as the No. 3 seed in the Eastern Conference and trending in the right direction heading into the NBA playoffs. 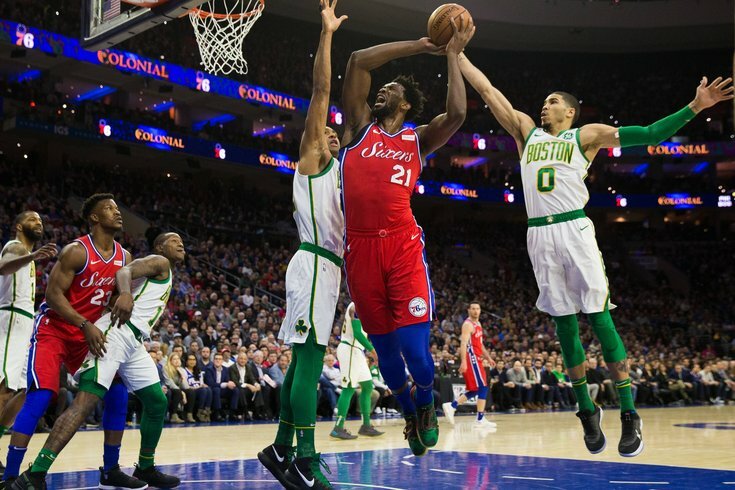 It's as good a time as any for Philadelphia to meet up with the Boston Celtics, their arch nemesis to the north that has served them a lot of humble pie over the last few years. Philadelphia has already lost the season series to Boston after dropping the first three games this year, and the struggle goes back much further than that. The Sixers have won just three games against Boston since Joel Embiid's rookie year, including playoffs, and many of those wins for Boston have been with "undermanned" teams missing Kyrie Irving. Games have been close, but Boston has owned this matchup. With one last date on the calendar for the regular season, the Sixers and Celtics both have their full assortment of players for Wednesday night's national television showcase. Here are a few trends I'll be watching tonight to see how they've changed from the past and whether they're sustainable heading into a potential playoff matchup. Embiid has refused to acknowledge how problematic this matchup has been for him publicly. After February's loss to Boston, Embiid pushed back against the idea with force. "He's not doing anything, it's just on me. I was sleepwalking for three quarters, and that's on me," Embiid told reporters. "It has nothing to do with anybody else." Public bravado is understandable, but it would serve the Sixers well if he's honest about this privately. Embiid has been miserable with Horford guarding him — over the last eight games since the start of last year's playoffs, Embiid has shot 25-for-70 with Horford guarding him (36 percent). That is not going to get it done for the Sixers, and solving this puzzle is the key to Philadelphia beating Boston. The simplest solution to this problem is to stop playing into Horford's strengths on defense. While Horford is still an excellent defender in one-on-one situations, his age has led to problems defending in space this season. If you can force him to move more laterally, you have a better chance of beating him compared to just pounding your shoulder into his chest. This is a matchup where Butler's skill set matters more than ever. The Sixers ran pick-and-roll on about a third of their possessions in the last game against Boston, and I'd expect that trend to continue on Wednesday. Butler did not necessarily skewer the Celtics as a scorer in these looks, but by shifting Horford's attention to the perimeter, the Sixers opened up easy looks by the basket. The big question for me is whether the Sixers will stick with the lineup combinations from this game or stay with the group they've been going with lately. Philadelphia paired Butler/Embiid and Harris/Simmons in that game, but they've switched to Harris/Butler and Embiid/Simmons partnerships over the last week, with Butler really taking off over that period. Horford will likely mirror Embiid's minutes, so I think there's an interesting question Brett Brown will need to answer: do you go back to Butler/Embiid to make Embiid's life easier, or do you try to win the minutes Embiid is out by handing the controls over to Butler? My guess is Brown leans the latter to preserve continuity, which puts even more pressure on Embiid to win the Horford matchup. It is no secret to anyone that JJ Redick is the weak link in Philadelphia's defensive chain. Tobias Harris isn't exactly prime Scottie Pippen, but he's at least big and athletic enough to keep up with guys and can contribute on the defensive glass. The Celtics absolutely love to pick on Redick. In February, the Celtics kept dumping the ball to Marcus Smart on the low block, where his strength advantage over the veteran shooter is best leveraged. Philadelphia would end up sending help so that Smart didn't demolish Redick, and Boston's ball movement killed them from there, with the Celtics producing a bunch of open threes out of this look. This gets into a concept Brett Brown talked about recently on a podcast with Zach Lowe. Every team goes into a matchup with an awareness of what they're willing to live and die with, supported by film, metrics prepared by the analytics team, and shorthand scouting notes. The biggest challenge for players and coaches is reacting when those ideas don't hold up in a game. This is an extreme example, but if you leave a bad shooter open and he makes seven threes in a row, it'd be insane to expect the guys on the floor to be comfortable leaving him open for the eighth attempt. Refusal to adjust can be a death sentence, even if the numbers suggest you went in with the "right" strategy. How does this relate to Redick's struggles? In talking to Philadelphia staffers after their last loss to Boston, there were some who were convinced the team just overreacted to matchups like Smart vs. Redick. Do they want Redick guarding post-ups? Certainly not. But from their view, they'd prefer to let one of Boston's worst offensive players continue to go one-on-one, rather than have their other guys help off of defenders and give up open threes to good shooters. Whether that works in practice is a different story. This is one big piece of information we haven't seen revealed yet. The Tobias Harris trade was significant for many reasons, but it is big in this matchup specifically because of the stress it puts on Irving, who did not play in the last meeting between these two teams. Against the "old" Sixers, Irving could reliably hide out on Robert Covington, who provided floor spacing but was a relatively stationary target. That equation has changed quite a bit since November. Simmons can post him up, Butler can abuse him off the dribble, Harris can post him or take him off the dribble, and if you stick him on JJ Redick, Irving has to chase him around a maze of screens, which adds a layer of fatigue that can hurt him on the offensive end. I'm not convinced this is some unsolvable problem for Boston, of course. They're fairly content to let Embiid bomb away from deep, so if they stick Irving on Simmons, they can use Horford or Aron Baynes to leave Embiid alone on the perimeter and help on Simmons near the rim. That leaves more natural matchups for the Celtics at the other spots and baits Embiid into shots the Celtics want him to take. Still, this is one matchup the Sixers should feel comfortable attacking. That was a lot of the difference in last year's playoff series — the Celtics had fewer weak links in the chain and Philly had fewer options to attack them than they do now — so they need to make this one count. When Embiid rolls on the initial set, Gordon Hayward is able to tag him coming down the lane without straying too far from Simmons, and it buys enough time for Horford to get back in the play and eventually guard the Embiid post-up. Simmons' limitations don't just hurt him individually, they impact the other stars around him. No one should expect him to wake up one day and be Ray Allen, but his performance in this matchup will likely make or break their chances. One more note here — if T.J. McConnell and Simmons share the floor together tonight, even if only for a minute, it is a waste of a minute. Boston will punish it, and Brown has to know that.